April 30th By Jay Willis. How much does it really cost to own a gun? Two weeks after Parkland became the latest American city to watch its name become synonymous with the horrors of gun violence, the cottage industry of Second Amendment commentary that springs up after each one of these tragic episodes was in full swing. Among its more strident defenders, as usual, was Fox News personality Andrew Napolitano, who penned an op-ed outlining his preferred justification for the continued existence of this country’s two-hundred-plus-year-old right to bear arms: It preserves the “natural right” of self-defense. This is not just a Fox News company line. It was a pillar of Justice Scalia’s reasoning in District of Columbia v. Heller, a Supreme Court case holding that the right to keep a handgun in one’s home is not dependent on service in a “well regulated militia.” (Napolitano says that when he asked the late justice why he sometimes used the term “pre-political” instead of “natural,” he replied. “You and I know they mean the same thing, but ‘natural’ sounds too Catholic, and I am interpreting the Constitution, not Aquinas.”) To these men, the Second Amendment is kind of a formality, enshrining in the law a common-sense truism as a matter of linguistic convenience. An important implication of this argument, says Napolitano, is that more Americans would be safer if only more Americans were self-reliant gun owners. “We all need to face a painful fact of life: The police make mistakes like the rest of us and simply cannot be everywhere when we need them,” he wrote after Parkland. “When government fails to recognize this and it disarms us in selected zones, we become helpless before our enemies.” But if the underlying purpose of the Second Amendment is to enable people to take responsibility for their own safety, one complication is that it does nothing to finance the exercise of that right. And owning a gun is expensive. A gun is a gun, no matter who holds it. NRA spokesperson Dana Loesch is fond of making this point, arguing that firearms act as the “great equalizer,” even among historically marginalized groups. But these statements are aspirational, not descriptive. Gun ownership is less common among African-Americans and Hispanics than whites, and more common among wealthier Americans than poorer ones. The financial and bureaucratic barriers to gun ownership, explained one California police officer, tend to disadvantage the same people who would supposedly be most empowered by the availability of tools of self-defense. “People don’t live in dangerous neighborhoods by choice—they often can’t afford to live anywhere else,” he said, noting that the task of obtaining a concealed carry permit, which most states require their proverbial Self-Reliant Good Guys with Guns to have, can be a cost-prohibitive one. “Citizens who want to do everything right can’t afford to legally protect themselves.” The cultural proliferation of guns has transformed the “right” of self-defense into a luxury available only to those who can afford it. The process of buying a gun is like buying a car from a really good salesperson: After you make up your mind to buy a gun, you will do your research, consider your needs, pore through reviews, ask friends for advice, and go for some test drives. Eventually, you will walk into a showroom intending to purchase a specific bundle of goods for what you hope is a fixed price. You will leave with a gun, but also with lots of other stuff—some of it mandatory, some of it optional, and none of it included in the amount you thought you would spend in the first place. Courtesy of gun owners, law enforcement personnel, and gun shop proprietors who generously agreed to help with this project, below are some rough estimates of what it might cost for a firearms novice to become a responsible, well-trained, law-abiding handgun owner. It is not exactly a task that everyone can afford to undertake. While personal taste in handguns varies, most people with whom I spoke recommended that a first-time buyer opt for a 9-millimeter handgun, which tend to be lighter and easier to fire than their larger-caliber counterparts. One gun shop salesperson showed me four different entry-level models, each of which offered different magazine capacities, grip backstraps, and finishes. The most expensive was $650; the least expensive was $500, excluding tax. As is the case when buying a car, you can save money by opting for a used model, or one from a down-market manufacturer. A gun shop owner in Texas told me that his wares start at just $219.99. But most of what he sells, he says, costs a shade under $500. You need two kinds: practice rounds for the range, and hollow-points—which expand in diameter upon contact—for self-defense. Popular online retailers will sell you 100 hollow-point rounds for around $40, and 100 rounds of practice ammunition for around $25. Again, opinions vary on how much ammunition is enough ammunition, but let’s say your first buy as a newly-christened pistol owner runs around $100. Most handguns come with one or two magazines—the detachable contraption that stores ammunition and is inserted into the grip. (No, it’s not a clip. Don’t call it a clip.) At $30 or $40 apiece, one gun owner recommends grabbing extras to cut down on reloading time at the range. Spend $15 and $30 on a speed loader, too, to save yourself the achy-fingered tedium of manually loading rounds into empty magazines. Basic cleaning supplies run around $20. A holster costs between $20 and $40, unless you’re fond of leather. Keep the handgun in an entry-level, portable gun safe, which your favorite sporting goods outfitter sells for around $40. Heavier-duty, in-home stationary safes—especially those that can store multiple firearms—can be much more expensive. That’s all before you get into attachable accessories. In a nighttime home intruder scenario, a high-lumen light mounted on a handgun’s rail system will help you identify who you’re pointing the gun at and temporarily blind them, buying additional precious seconds to decide what to do. Several gun owners listed this as a must-have accessory, and it is not cheap. A good one costs around $150. Members of gun-owning families are in luck here, since they benefit from the wisdom of experienced relatives from whom they can learn for free. If you don’t come from one of those, though, you’ll need to learn yourself. A range near me offers an introductory class for about $90, which covers topics like vocabulary, storage, safety, marksmanship, and operation. Basic eye and ear protection comes bundled together for $30. An annual range membership, including daily usage fees, can run between $275 and $350, depending on the market and the frequency with which you visit. One gun owner recommended shooting at least once a month to ensure that your skills don’t atrophy. Remember, that’s a box or two of practice rounds every time. A gun is most useful for self-defense—the type that can stop mass shootings, at least—if you have the option of bringing it outside. Most states require gun owners to pay for this privilege, at the very least. To get a concealed pistol license in Washington, I had to pay $48 at the sheriff’s office, which took my fingerprints and ran a background check. (In New York City, the fee is $340, which does not include fingerprinting costs.) There were no tests of my skills or questions about my motives for applying. A month later, I received a laminated, wallet-size card affirming my right to bring a handgun into the drugstore. Other states impose more stringent prerequisites. Residents of Florida who want a concealed carry permit have to complete an approved firearms education course first. In Illinois and Maryland, first-time applicants must undergo 16 hours of classroom training—that’s two full workdays of instruction—and demonstrate proficiency in a range test, hitting the designated target at least 70 percent of the time. In places that allow law enforcement to exercise discretion, getting a permit may be functionally impossible, even for those who can meet all the legal requirements. Between state) and local fees, a California “carry concealed weapon” permit, or CCW, costs around $300. But in 2014, the San Francisco Chronicle reported that in Alameda County—home to Oakland, Berkeley, and some 1.6 million Californians at the time—law enforcement officials had issued a total of 170 permits. San Francisco, a city of more than 850,000 people, famously evaluates CCW applications on a strict “necessity” standard. As of 2014, there were fewer than 10 of them. One gun shop owner estimated that a prospective gun owner, at an absolute minimum, could buy a cheap pistol and a single box of defensive rounds for around $250. But these are half-measures. Becoming a safe, responsible, well-trained gun owner—the kind of person who is ready to exercise their natural right to self-defense to the fullest, whether from a intruder in the home or a mass shooter at the mall—costs well over $1,000. In more expensive markets, if you factor in the time and expense associated with necessary training, that figure could almost double. Conversations about gun policy rarely consider how the sticker price of hardware might affect ownership patterns. But the nonpartisan Pew Research Center has found that NRA membership rates are highest among gun owners who report household incomes of greater than $100,000. A 2014 analysis published by NORC, a nonpartisan research organization affiliated with the University of Chicago, found that 44 percent of respondents with incomes above $90,000 had a gun in the home. For those making between $25,000 and $49,999, the rate fell to 32.1 percent. Below $25,000, it was only 18.2 percent. When the data is broken down into even smaller intervals, says Tom Smith, one of the NORC study’s co-authors, the gradient starts to look “pretty steep.” The most recent three years of biannual data from the General Social Survey, which is administered by NORC, show that the likelihood of finding a gun in the house correlates pretty strongly with whether the people who live in it manage to clear six figures. As a practical matter, maybe Napolitano would concede that fewer than 100 percent of people need to be armed in order to prevent mass shootings, especially in urban areas. But every admission like this one undermines the principle of self-reliance, and doubles as a tacit acknowledgement that having more guns in a confined space is an inherently dangerous thing. Besides, choosing the winners—deciding how many good gun owners counts as “enough,” and who doesn’t need to be able to protect themselves in order to be considered “safe”—is an inherently political process, and one that is unlikely to be more charitable to marginalized groups than the status quo. Astute legal scholars will remind you that the Second Amendment is a negative right—that it protects the right to own guns, but that nothing obligates the government to make sure everyone exercises it equally. The Bill of Rights is full of promises like this one, which sound noble and egalitarian in theory but are kinder to wealthier people in practice. Celebrating the virtues of equality while ignoring the consequences of inequity has always been the American way. This is coherent as a legal argument, but it fails as a moral one. The Second Amendment is the only one that implicates possession of a tangible object, and the unstated reason people require guns to defend themselves is that other people—bad people—are assumed to have guns, too. The right to bear arms is a “necessity” borne of some 250 years of treating guns as part of the fabric of American society, not as the affirmative policy choice that it is. Today, the Second Amendment bestows its unique brand of freedom only on those who can afford a gun, paying a de facto tax to feel a little less vulnerable to the omnipresent threat of harm. If we justify the right to bear arms on self-defense grounds—if it is convenient shorthand for a natural right to protect ourselves—we also accept that for anyone who can’t pay this tax, the right is a hollow one. This rationale’s most insidious implication is that it casts doubt on the idea that a greater social obligation exists to protect members from harm. “I’m not going to be a Gabby Giffords,” explained GOP congressman Ralph Norman after displaying his pistol during a recent public appearance. In 2011, the Arizona legislator was shot in the head by a man who used his legally-obtained handgun to kill six people that morning. Norman’s message is clear: If she had brought a pistol to that grocery store, perhaps things would have turned out differently. The availability of guns in the marketplace enables people to feel less responsible for doing the hard work of addressing gun violence, because it permits them to think of self-defense as a choice—even for those who may not actually have one. I can’t fault anyone who wants to do all that they can to protect themselves and their loved ones. I respect the decisions of responsible, thoughtful people who use their resources to learn how to use a gun for that purpose. But I am troubled by the fact that doing so is a privilege—another way in which America’s culture of guns is most dangerous for the most vulnerable people who live in it. Extreme violence comes with a price for everyone involved: the suspect, the victim, the families of both, and witnesses in close proximity. Whether you were directly injured, survived physically unharmed, witnessed the attack, or simply are related to someone involved, it’s important to understand what you may experience moving forward. This is a complex topic to fully understand, but a basic knowledge of what may be experienced is so essential. You’re Not Alone – No one leaves a violent encounter unchanged. No one. The degree to which you are affected may differ person to person, but no one walks away unscathed. I truly believe this is important to note to give yourself permission to feel however it is that you feel. You may feel embarrassed or ashamed for being affected, and it’s important to know you’re not alone. It depends on who you ask. And it may not be the same for everyone. What do I wish to accomplish at the end of my training? How much time are you willing to commit to practice the skills you learn? Consider the time it took to learn to drive an automobile. One lesson, two, 10? First you had to learn how to operate the vehicle, turn the ignition, position the seat, mirrors, turn signal operation, how to put it in gear, gas, brakes….and all those other buttons. Not to mention how to properly maintain the vehicle so it is reliable. Let’s not forget the laws regarding driving. You have to learn the laws before you start driving. There is a test you must take, just to be sure you get it right. After all, a car can be considered dangerous to yourself and to others, when not operated correctly and legally. So, you sign up for an all day, 8 hour class to learn to shoot. Then, you wait 30-60 days, or more, before going to the range to practice what you learned in class. How much do you think you would remember? Would it be enough to save your life in a deadly confrontation? How many classes, and how many times did you practice driving before taking your driving test? It’s pretty simple, more training and practice is always needed to become competent at any skill. Especially one involving the possibility of loss of life. Learning to shoot a handgun can be a fun and exciting experience when done in a comfortable, safe environment with professional instructors. This 5 hour class is a great refresher course for shooters with limited experience, but is specifically designed for students who are new to guns with no shooting experience. Once you have completed one of our classes, you are invited to join our shooting club, (no charge) The Scarlet Pistols, and enjoy shooting practice with our instructors and other student alumni. It’s a great way to stay current and practice your skills with other shooters in a friendly environment. 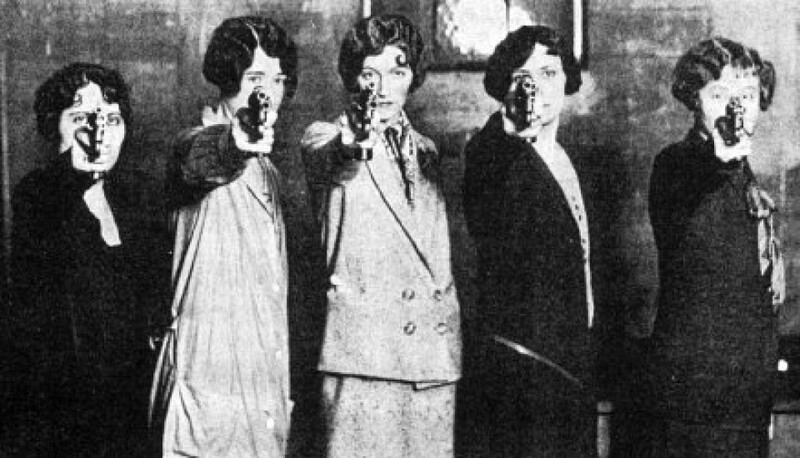 Women and Guns is proud to announce the revival of the Scarlet Pistols Shooting Group! Beginning July 3, 2017, and every Monday there after, any woman who previously attended any of our shooting classes is welcome and encouraged to attend. Our goal is to encourage women to practice the skills they learned in class while enjoying an afternoon of fun with other women. We will meet at the New Lakewood Shooting Range, 2:00pm is our target start time, but late arrivals are fine, (we realize traffic can be a factor). The range is open until 9:00pm. The range fee for ladies is $12.50 per lane, $10 for an additional shooter sharing the same lane. Friends and family are welcome to attend, but must be 18 years or older, and have some basic firearms safety training to join our group. Women and Guns will provide tips to improve your shooting techniques. Bring your own guns and ammunition, or plan to rent a gun at the range and purchase ammunition and targets. If it is your first time to the range, there will be a short safety video and the usual paperwork to complete before you start shooting. Depending on the turn out, we may even have a “just for fun” shooting competition! If you have not had a chance to experience the new Lakewood Shooting Range and Welchers New Gun Shop, plan to visit them soon. You won’t be disappointed! If you missed the Facebook post or are not on our email list, there is still time to RSVP and attend our first Women and Guns Student Reunion at the new Lakewood Shooting Range! Show up at 6:30 for registration and safety briefing. Shoot from 7-8pm, just $12.50. for ladies. Free instruction and targets. Bring your own guns and ammo, rent one at range, or borrow one of ours. Friends and family welcome! Questions? Send me an email or message me on Women and Guns Facebook page. See you at the range! Review of Welcher’s Gun Shop, Lakewood Shooting Range, June 7, 2017. WOW!! Amazing practice session at Welchers Gunshop and new Lakewood Shooting Range. The place is first class all the way to the beautiful laminate flooring throughout. The range staff are professional, friendly and very helpful. RSO on the floor at all times, plus security cameras. The air quality in the range is outstanding. 16 shooting stalls are now open, all with electronic target carriers. And LOTS OF SPACE behind the shooting benches, no crowding or bumping into people. A+ in every category. I will be a regular customer. The retail store is spacious and well stocked, prices are very competitive. Check it out, Bridgeport exit off of I-5, right next door to the Ford dealership. Lots of parking.